Finally! I have been wanting to introduce this design as ring since Stonehenge was carved from the living rock..... well, not that long really, but I am very proud and pleased with the fruition of this in 2016 and online in 2017. This piece is designed as an easy to wear womans ring, with a medium shank for a comfy and sturdy feel. In these times, who doesnt need a little extra protection to wear with pride and traditional expression? 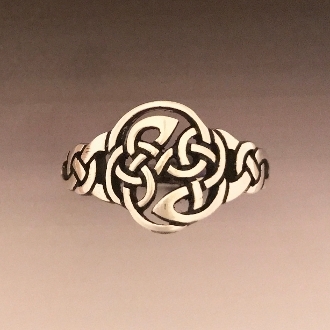 The diameter of the top comes in around 14mm, and is pierced through almost entirely for those that appreciate openwork Sterling Silver designs. For further historic and sybolic perspective, read on! This Ancient symbol was carved into stone by the artisians of the Pictish Tribal culture. The primary function of this pattern was to ward off unseen negative forces. This design is crafted from a single knotwork strand, and is complete and whole within itself, and thus impervious to outside influence and forces. The ancestral origin of the "Picts" and their famous "Pictish Stones" lie in the Northern Highlands of Scotland. Subsequently the symbolic beauty and historic useage of the "Pictish School of Art" was incorported into the many Celtic Art Styles of Scotland, Ireland, Wales, and beyond. Copyright © 1997-2017. All rights reserved.